Can anyone else believe it is October 1st already? 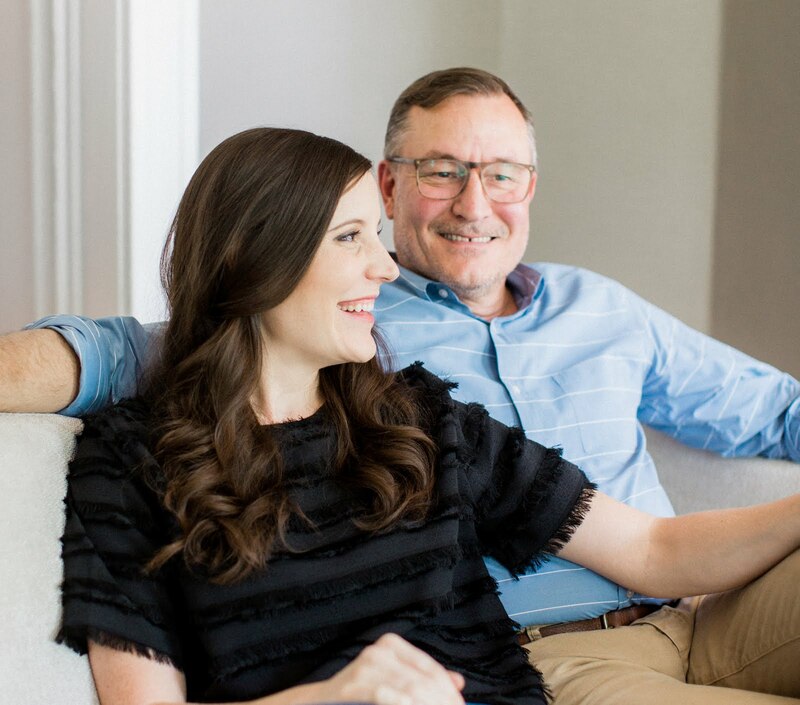 We love fall here in Richmond as the leaves change and the streets of our neighborhood become about as beautiful as any we have seen. 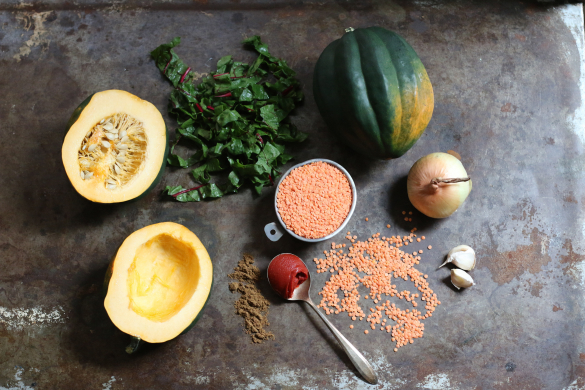 With autumn comes all of the flavors it has to bring — greens, root vegetables and of course hearty squash varieties! 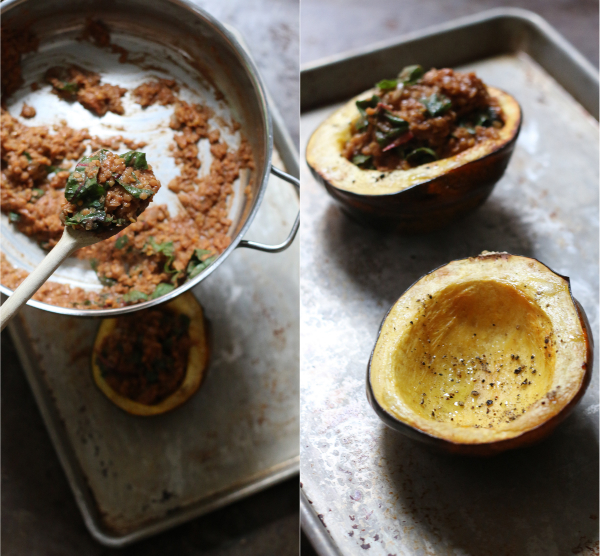 Acorn squash is one of our favorite fall varieties to cook with and I've been looking forward to sharing one of my favorite ways to prepare it here on the blog. This recipe combines a little sweetness and a faint touch of India with the addition of garam marsala mixed in with the red lentils. 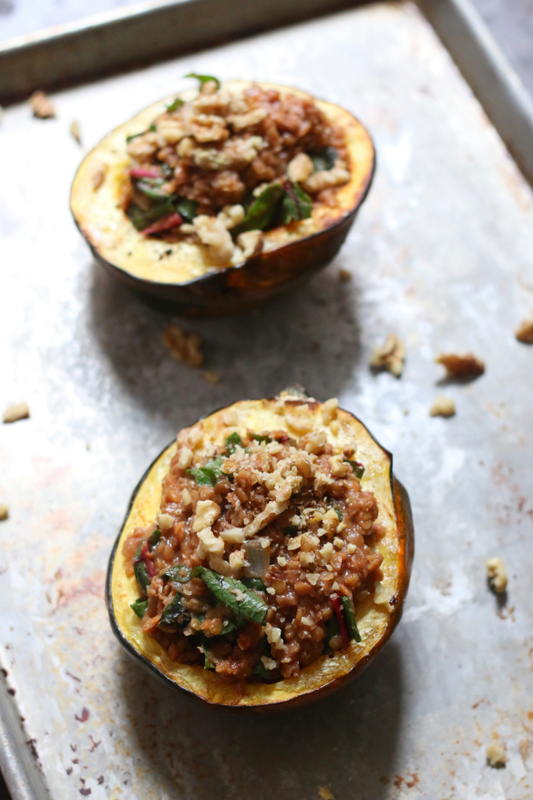 Throw in another fall favorite, swiss chard, and we have ourselves a filling meal that's actually vegan-friendly as an added bonus! 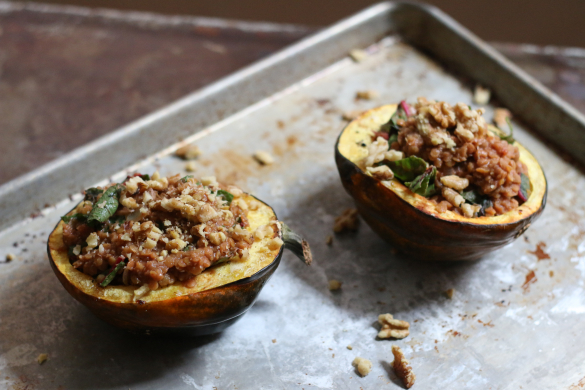 Preheat oven to 400° and start by slicing the acorn squash in half, scooping out the pulp and seeds. Brush 1 tablespoon of olive oil on both halves and sprinkle with salt and pepper — bake on center rack of the oven on a sheet pan for 25-30 minutes. 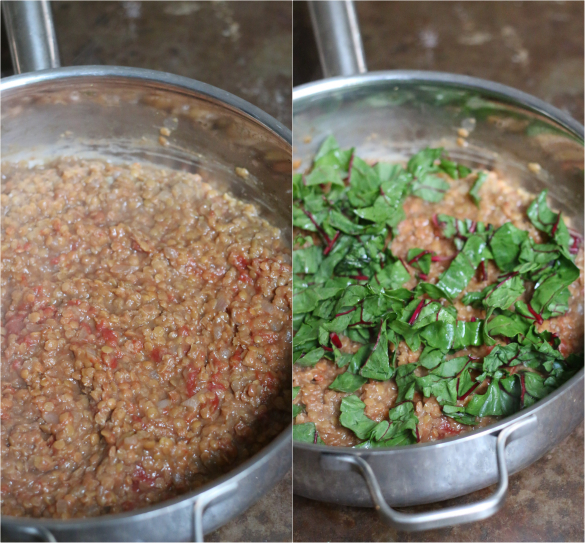 Once the liquid is just about absorbed mix in the tomato paste, stirring to incorporate, then add the swiss chard, once again stirring to combine. One of the (many!) beauties of this dish is how it can be served immediately or prepared ahead of time to reheat in the oven when you are ready to serve. Can't you just almost smell the autumn aromas bursting off this baking pan. 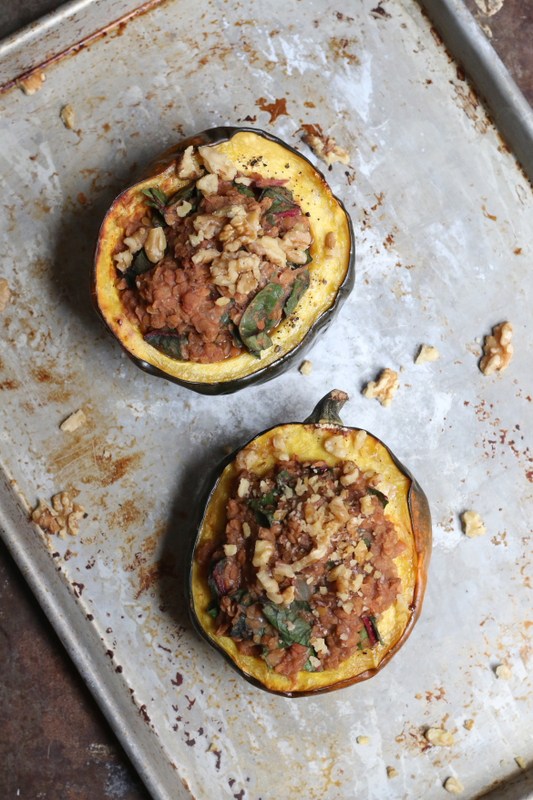 Who else is excited for fall cooking? Do you have a favorite way to prepare fall and winter squash or just look forward to seeing their bright colors offered in the markets? Let us know in the comments sections — we're always looking for new recipes to try. Made this tonight for dinner. Used unrefined coconut oil instead of olive because I wanted that touch of coconut flavor, and green lentils instead of red because they are what I had on hand. The flavors were on point. It isn't that far of a leap from mujaddara, one of our favorite meatless weeknight meals, to this, though I couldn't help but think that sausage would be an amazing addition if I were feeding carnivores. Will be serving this to some vegetarian friends in the very near future, following a first course of cauliflower soup. High fives all around. So happy to hear this! So happy you tried it and enjoyed it! So happy you enjoyed the recipe! Just tried this tonight and could not be more pleased with the results. 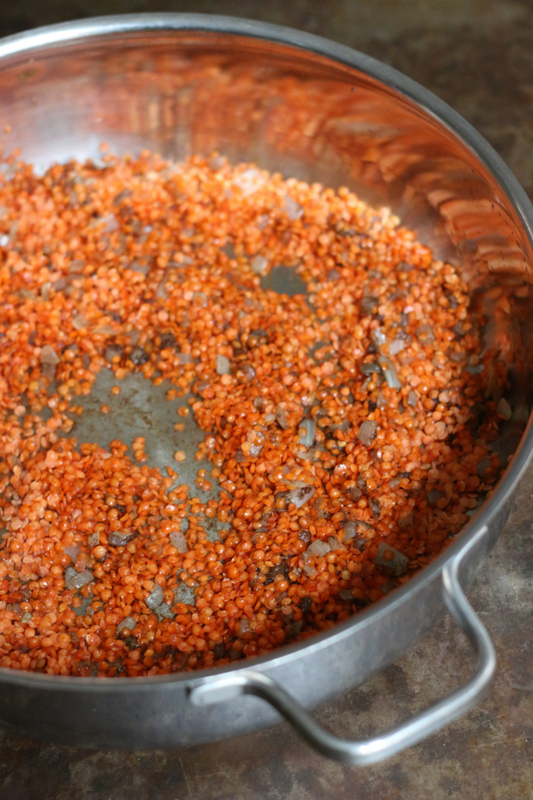 My only variations were that I cooked the lentils in coconut milk and diced up the squash to stir in with the lentils. Sublime, extremely filling and inexpensive to boot; I'll be eating off this for two days at least!